Yesterday in Toronto Joni Mitchell gave a rare performance and got up on stage to sing a few songs which were all rewarded with a standing ovation. It was Joni's 70th birthday tribute (I can't believe it!) at Toronto's Massey Hall. I have the above vintage pic of her on my wall at home and I love it because it always makes me smile. 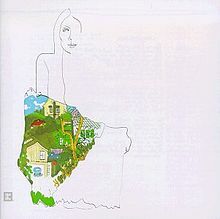 Joni Mitchell was a huge part of my life musically in my teens, and I still listen and love her music today. I am off to listen to my favourite of the moment "The Circle Game" from her 1970 album Ladies of the Canyon.Its title refers to Laurel Canyon, a center of popular music culture in Los Angeles during the sixties. Wishing a Happy Birthday to this wonderful musician, poet and artist.